Our Blackheath observing session started early this month in order to catch the conjunction of Mars and Venus. Despite having to cancel on Friday we benefitted from mostly clear skies on Saturday. The conjunction did not disappoint and was clearly visible as was the distinctive orange colour of Mars. 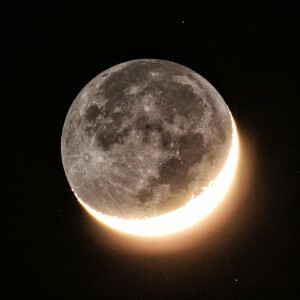 Above the two planets was the crescent Moon with its normally dark shadow lit by earthshine. Despite the early start the event was well supported even though a constant cold breeze did its best to freeze us off the heath! As the night progressed the familiar sight of Orion and Jupiter came into view along with other winter sky views. A special thanks must go to Tej who managed to attract a small crowd and then entertained them with ‘Tej’s Sky Tours’ giving the visitors with a tour of the Sky. Well done. We look forward to welcoming everyone to the next observing session in March.